Follow these 12 steps to plant your seedlings and you will be growing in no time! 1. Prepare your soil. Begin by working the soil as early in the season as possible, but avoid working in wet soil. Once you choose the site, add a 1 to 2 inch layer of well-rotted compost to improve the soil's texture, increase drainage, and provide a slow release of nutrients. You may add greensand or kelp meal according to the amounts listed on the package to supply trace minerals and potassium and/or alfalfa meal to provide nitrogen. Rock phosphate is a great source of phosphorous. Or, add a complete and slow-release fertilizer at planting time to supply these nutrients. Use a digging fork to blend the supplements into the top 2 to 3 inches of soil and to bring oxygen to the deeper layers of soil. 3. Water the garden beds the day before transplanting. The soil should be slightly moist when planting. 4. Water the seedlings well several hours before transplanting them in the garden to avoid handling and planting a soggy root ball. 5. Choose a cloudy day to transplant or wait until early evening to plant. Planting at these times will prevent excessive moisture losses due to evaporation. If this is not possible, plan to temporarily cover your plants with shade cloth, a row cover, or even a cloth tent to shield them until the roots are able to access water and supply it to the top growth. You can also use plastic milk containers with the bottoms cut out and the caps removed. When planting cool-weather crops, such as broccoli, be wary of sudden cold snaps soon after planting and protect young seedlings accordingly. 6. Dig the planting hole slightly larger than the root ball. If you did not add amendments to your soil already, add a handful of rock phosphate or bone meal to the bottom of the hole at this time to boost future blooming and fruiting. 7. Carefully remove the seedlings from the container by inverting the container while your fingers straddle the stem of the plant. Gently squeeze the container and tap it lightly to allow the root ball to separate from the sides of the pot. Avoid pulling the plant out by the stem or leaves as permanent damage may occur. 8. Scratch the root ball with a hand-held fork or with your fingers to loosen it. This will allow the roots to move freely through the soil in search of food and water. 9. Set the plants at the same soil level that they were planted in the original containers. 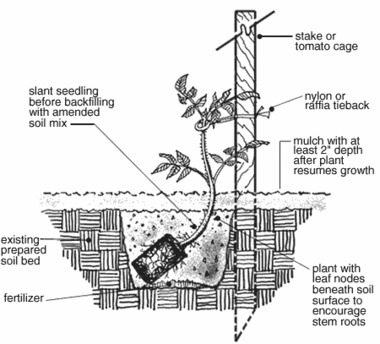 Tomatoes are an exception and may be set deeper and at a slant into the soil. 10. Backfill and lightly firm the soil around the roots to remove any air pockets. Water seedlings with a starter fertilizer to settle the soil. 11. Water the entire bed until it is evenly moistened but not saturated. This watering will also settle the soil around the transplant's roots, removing any air pockets. 12. Mulch the beds once the soil has warmed in the spring garden or once the seedlings have begun to grow in the fall garden. Mulch helps retain soil moisture and maintain even soil temperatures. Keep mulch several inches away from the immediate stem or crown area of the seedling.